SUBHEAD: Adjusting energy demand to supply would make switching to renewable energy much more realistic. Image above: Detail from painting "Stoneferry" by John Ward in 1835. This painting depicts a scene on the River Hull near to the oilseed-crushing mills at Stoneferry in Hull England. From original article. The same approach could be very useful today, especially when improved by modern technology. In particular, factories and cargo transportation -- such as ships and even trains -- could be operated only when renewable energy is available. Before the Industrial Revolution, both industry and transportation were largely dependent on intermittent renewable energy sources. Water mills, windmills and sailing boats have been in use since Antiquity, but the Europeans brought these technologies to full development from the 1400s onwards. At their peak, right before the Industrial Revolution took off, there were an estimated 200,000 wind powered mills and 500,000 water powered mills in Europe. Initially, water mills and windmills were mainly used for grinding grain, a laborious task that had been done by hand for many centuries, first with the aid of stones and later with a rotary hand mill. Wind- and water mills also processed a host of agricultural products. They were pressing olives, hulling barley and rice, grinding spices and tobacco, and crushing linseed, rapeseed and hempseed for cooking and lighting. 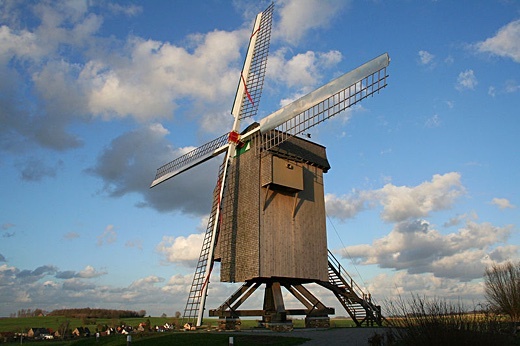 So-called 'industrial water mills' had been used in Antiquity and were widely adopted in Europe by the fifteenth century, but 'industrial windmills' appeared only in the 1600s in the Netherlands, a country that took wind power to the extreme. The use of wind power for transportation – in the form of the sailboat – also boomed from the 1500s onward, when Europeans 'discovered' new lands. Even though it relied on intermittent wind sources, international trade was crucial to many European economies. For example, the Dutch shipbuilding industry, which was centred around some 450 wind-powered saw mills, imported virtually all its naval stores from the Baltic: wood, tar, iron, hemp and flax. Even the food supply could depend on wind-powered transportation. Towards the end of the 1500s, the Dutch imported two thousand shiploads of grain per year from Gdansk. Sailboats were also important for fishing. Although variable renewable energy sources were critical to European society for some 500 years before fossil fuels took over, there were no chemical batteries, no electric transmission lines, and no balancing capacity of fossil fuel power plants to deal with the variable energy output of wind and water power. So, how did our ancestors deal with the large variability of renewable power sources? To some extent, they were counting on technological solutions to match energy supply to energy demand, just as we do today. The water level in a river depends on the weather and the seasons. Boat mills and bridge mills were among the earliest technological fixes to this problem. 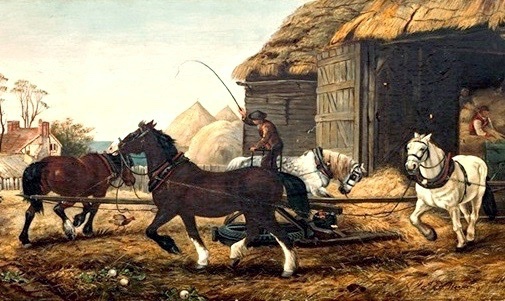 Image above: "The Horse Mill" is a painting by English animal painter James Herring circa 1850 depicting a milling of grain by animal power. From original article. A technological solution to the intermittency of both water and wind power was the 'beast mill' or 'horse mill'. In contrast to wind and water power, horses, donkeys or oxen could be counted on to supply power whenever it was required. However, beast mills were expensive and energy inefficient to operate: feeding a horse required a land area capable of feeding eight humans. Consequently, the use of animal power in large-scale manufacturing processes was rare. Obviously, beast mills were not a viable backup power source for sailing ships either. In principle, sailing boats could revert to human power when wind was not available. However, a sufficiently large rowing crew needed extra water and food, which would have limited the range of the ship, or its cargo capacity. Therefore, rowing was mainly restricted to battleships and smaller boats. Because of their limited technological options for dealing with the variability of renewable energy sources, our ancestors mainly resorted to a strategy that we have largely forgotten about: they adapted their energy demand to the variable energy supply. In other words, they accepted that renewable energy was not always available and acted accordingly. For example, windmills and sailboats were simply not operated when there was no wind. In industrial windmills, work was done whenever the wind blew, even if that meant that the miller had to work night and day, taking only short naps. Often enough when the wind blew in autumn, the miller would work from Sunday midnight to Tuesday evening, Wednesday morning to Thursday night, and Friday morning to Saturday midnight, taking only a few snatches of sleep; and a good windmiller always woke up in bed when the wind rose, getting up in the middle of the night to set the mill going, because the wind was his taskmaster and must be taken advantage of whenever it blew. A similar approach existed for overseas travel, using sail boats. When there was no wind, sailors stayed ashore, maintained and repaired their ships, or did other things. They planned their trips according to the seasons, making use of favourable seasonal winds and currents. Winds at sea are not only much stronger than those over land, but also more predictable. The lower atmosphere of the planet is encircled by six major wind belts, three in each hemisphere. From Equator to poles these 'prevailing winds' are the trade winds, the westerlies, and the easterlies. The six wind belts move north in the northern summer and south in the northern winter. Five major sea current gyres are correlated with the dominant wind flows. Gradually, European sailors deciphered the global pattern of winds and currents and took full advantage of them to establish new sea routes all over the world. By the 1500s, Christopher Columbus had figured out that the combination of trade winds and westerlies enabled a round-trip route for sailing ships crossing the Atlantic Ocean. The trade winds reach their northernmost latitude at or after the end of the northern summer, bringing them in reach of Spain and Portugal. These summer trade winds made it easy to sail from Southern Europe to the Caribbean and South America, because the wind was blowing in that direction along the route. The journey from the English Channel to New York took 35-40 days in winter and 40-50 days in summer. To Cape Town, Melbourne, and Calcutta took 50-60 days, 80-90 days, and 100-120 days, respectively. These travel times are double to triple those of today's container ships, which vary their speed based on oil prices and economic demand. As a strategy to deal with variable energy sources, adjusting energy demand to renewable energy supply is just as valuable a solution today as it was in pre-industrial times. However, this does not mean that we need to go back to pre-industrial means. We have better technology available, which makes it much easier to synchronise the economic demands with the vagaries of the weather. In the following paragraphs, I investigate in more detail how industry and transportation could be operated on variable energy sources alone, and demonstrate how new technologies open new possibilities. I then conclude by analysing the effects on consumers, workers, and economic growth. On a global scale, industrial manufacturing accounts for nearly half of all energy end use. Many mechanical processes that were run by windmills are still important today, such as sawing, cutting, boring, drilling, crushing, hammering, sharpening, polishing, milling, turning, and so on. All these production processes can be run with an intermittent power supply. The same goes for food production processes (mincing, grinding or hulling grains, pressing olives and seeds), mining and excavation (picking and shovelling, rock and ore crushing), or textile production (fulling cloth, preparing fibres, knitting and weaving). In all these examples, intermittent energy input does not affect the quality of the production process, only the production speed. However, not only are wind turbines (and water turbines) more practical and powerful than in earlier times, we can now make use of solar energy to produce mechanical energy. This is usually done with solar photovoltaic (PV) panels, which convert sunlight into electricity to run an electric motor. Consequently, a factory that requires mechanical energy can be run on a combination of wind and solar power, which increases the chances that there's sufficient energy to run its machinery. Another crucial difference with pre-industrial times is that we can apply the same strategy to basic industrial processes that require thermal energy instead of mechanical energy. Heat dominates industrial energy use, for instance, in the making of chemicals or microchips, or in the smelting of metals. In pre-industrial times, manufacturing processes that required thermal energy were powered by the burning of biomass, peat and/or coal. The use of these energy sources caused grave problems, such as large-scale deforestation, loss of land, and air pollution. Although solar energy was used in earlier times, for instance, to evaporate salt along seashores, to dry crops for preservation, or to sunbake clay bricks, its use was limited to processes that required relatively low temperatures. Today, renewable energy other than biomass can be used to produce thermal energy in two ways. First, we can use wind turbines, water turbines or solar PV panels to produce electricity, which can then be used to produce heat by electrical resistance. This was not possible in pre-industrial times, because there was no electricity. Second, we can apply solar heat directly, using water-based flat plate collectors or evacuated tube collectors, which collect solar radiation from all directions and can reach temperatures of 120 degrees celsius. We also have solar concentrator collectors, which track the sun, concentrate its radiation, and can generate temperatures high enough to melt metals or produce microchips and solar cells. These solar technologies only became available in the late 19th century, following advances in the manufacturing of glass and mirrors. Running factories on variable power sources doesn't exclude the use of energy storage or a backup of dispatchable power plants. Adjusting demand to supply should take priority, but other strategies can play a supportive role. First, energy storage or backup power generation capacity could be useful for critical production processes that can't be halted for prolonged periods, such as food production. Compared to pre-industrial times, we now have more and better energy storage options available. For example, we can use biomass as a backup power source for mechanical energy production, something pre-industrial millers could not do – before the arrival of the steam engine, there was no way of converting biomass into mechanical energy. We also have chemical batteries, and we have low-tech systems like flywheels, compressed air storage, hydraulic accumulators, and pumped storage plants. Heat energy can be stored in well-insulated water reservoirs (up to 100 degrees) or in salt, oil or ceramics (for much higher temperatures). All these storage solutions would fail for some reason or another if they were tasked with storing a large share of renewable energy production. However, they can be very useful on a smaller scale in support of demand adjustment. Cargo transportation is another candidate for using renewable power when it's available. This is most obvious for shipping. Ships still carry about 90 percent of the world's trade, and although shipping is the most energy efficient way of transportation per tonne-kilometre, total energy use is high and today's oil powered vessels are extremely polluting. A common high-tech idea is to install wind turbines off-shore, convert the electricity they generate into hydrogen, and then use that hydrogen to power seagoing vessels. However, it's much more practical and energy efficient to use wind to power ships directly, like we have done for thousands of years. Furthermore, oil powered cargo ships often float idle for days or even weeks before they can enter a port or leave it, which makes the relative unpredictability of sailboats less problematic. As with industrial manufacturing, we now have much better technology and knowledge available to base a worldwide shipping industry on wind power alone. We have new materials to build better and longer-lasting ships and sails, we have more accurate navigation and communication instruments, we have more predictable weather forecasts, we can make use of solar panels for backup engine power, and we have more detailed knowledge about winds and currents. More recently, yacht racing has generated many innovations that have never been applied to commercial shipping. For example, in the 2017 America's Cup, the Emirates Team New Zealand introduced stationary bikes instead of hand cranks to power the hydraulic system that steers the boat. Speed sailing records are also telling. The fastest sailboat in 1972 did not even reach 50 km/h, while the current record holder -- the Vestas Sailrocket 2 -- sailed at 121 km/h in 2012. While these types of ships are not practical to carry cargo, they could inspire other designs that are. We could follow a similar approach for land-based transportation, in the form of wind and solar powered trains. Like sailing boats, trains could be running whenever there is renewable energy available. Not by putting sails on trains, of course, but by running them on electricity made by solar PV panels or wind turbines along the tracks. Running cargo trains on renewable energy is a great use of intermittent wind power because they are usually operated at night, when wind power is often at its best and energy demand is at its lowest. Furthermore, just like cargo ships, cargo trains already have unreliable schedules because they often sit stationary in train-yards for days, waiting to become fully loaded. Even the speed of the trains could be regulated by the amount of renewable energy that is available, just as the wind speed determines the speed of a sailing ship. A similar approach could also work with other electrical transportation systems, such as trolleytrucks, trolleyboats or aerial ropeways. Combining solar and wind powered cargo trains with solar and wind powered factories creates extra possibilities. For example, at first sight, solar or wind powered passenger trains appear to be impossible, because people are less flexible than goods. If a solar powered train is not running or is running too slow, an appointment may have to be rescheduled at the last minute. Likewise, on cloudy days, few people would make it to the office. However, this could be solved by using the same renewable power sources for factories and passenger trains. Solar panels along the railway lines could be sized for cloudy days, and thus guarantee a minimum level of energy for a minimum service of passenger trains (but no industrial production). During sunny days, the extra solar power could be used to run the factories along the railway line, or to run extra passenger (or cargo) trains. As we've seen, if industrial production and cargo transportation became dependent on the availability of renewable energy, we would still be able to produce a diverse range of consumer goods, and transport them all over the globe. However, not all products would be available all the time. If I want to buy new shoes, I might have to wait for the right season to get them manufactured and delivered. Production and consumption would depend on the weather and the seasons. Solar powered factories would have higher production rates in the summer months, while wind powered factories would have higher production rates in the winter months. Sailing seasons also need to be taken into account. But running an economy on the rhythms of the weather doesn't necessarily mean that production and consumption rates would go down. If factories and cargo transportation adjust their energy use to the weather, they can use the full annual power production of wind turbines and solar panels. Manufacturers could counter seasonal production shortages by producing items 'in season' and then stocking it close to consumers for sale during low energy periods. In fact, the products themselves would become 'energy storage' in this scenario. Instead of storing energy to manufacture products in the future, we would manufacture products whenever there is energy available, and store the products for later sale instead. However, seasonal production may well lead to lower production and consumption rates. Overproducing in high energy times requires large production facilities and warehouses, which would be underused for the rest of the year. To produce cost-efficiently, manufacturers will need to make compromises. From time to time, these compromises will lead to product shortages, which in turn could encourage people to consider other solutions, such as repair and re-use of existing products, crafted products, DIY, or exchanging and sharing goods. Adjusting energy demand to energy supply also implies that the workforce adapts to the weather. If a factory runs on solar power, then the availability of power corresponds very well with human rhythms. The only downside is that workers would be free from work especially in winter and on cloudy days. However, if a factory or a cargo train runs on wind power, then people will also have to work during the night, which is considered unhealthy. The upside is that they would have holidays in summer and on good weather days. If a factory or a transportation system is operated by wind or solar energy alone, workers would also have to deal with uncertainty about their work schedules. Although we have much better weather forecasts than in pre-industrial times, it remains difficult to make accurate predictions more than a few days ahead. However, it is not only renewable power plants that are now completely automated. The same goes for factories. The last century has seen increasing automation of production processes, based on computers and robots. So-called “dark factories” are already completely automated (they need no lights because there is nobody there). If a factory has no workers, it doesn't matter when it's running. Furthermore, many factories already run for 24 hours per day, partly operated by millions of night shift workers. In these cases, night work would actually decrease because these factories will only run through the night if it's windy. Finally, we could also limit the main share of industrial manufacturing and railway transportation to normal working hours, and curtail the oversupply during the night. In this scenario, we would simply have less material goods and more holidays. On the other hand, there would be an increased need for other types of jobs, like craftsmanship and sailing. In conclusion, industrial manufacturing and cargo transportation -- both over land and over sea -- could be run almost entirely on variable renewable power sources, with little need for energy storage, transmission networks, balancing capacity or overbuilding renewable power plants. In contrast, the modern high-tech approach of matching energy supply to energy demand at all times requires a lot of extra infrastructure which makes renewable power production a complex, slow, expensive and unsustainable undertaking. Adjusting energy demand to supply would make switching to renewable energy much more realistic than it is today. There would be no curtailment of energy, and no storage and transmission losses. All the energy produced by solar panels and wind turbines would be used on the spot and nothing would go to waste. Admittedly, adjusting energy demand to energy supply can be less straightforward in other sectors. Although the internet could be entirely operated on variable power sources -- using asynchronous networks and delay-tolerant software -- many newer internet applications would then disappear. At home, we probably can’t expect people to sit in the dark or not to cook meals when there is no renewable energy. Likewise, people will not come to hospitals only on sunny days. In such instances, there is a larger need for energy storage or other measures to counter an intermittent power supply. That's for a next post. SUBHEAD: We should think about the kind of society is sustainable and resilient in times of increasing vulnerability to disasters of all kinds. 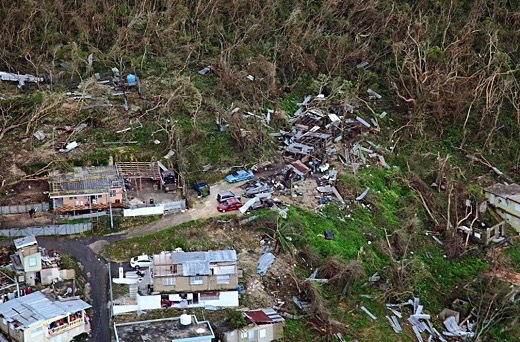 Image above: Aerial photo of damage from Maria to hillside homes in Puerto Rico after hurricane Maria destroyed much of the infrastructure of the island. From original article. News reports tell of the devastation left by a direct hit from Category 4 Hurricane Maria. Puerto Ricans already coping with damage from Hurricane Irma, which grazed the island just days before, were slammed with an even stronger storm on September 20, bringing more than a foot of rain and maximum sustained winds of at least 140 miles per hour. There is still no electricity—and likely won’t be for weeks or months—in this U.S. territory of 3.4 million people, many of whom also lack running water. Phone and internet service is likewise gone. Nearly all of Puerto Rico’s greenery has been blown away, including trees and food crops. A major dam is leaking and threatening to give way, endangering the lives of tens of thousands. This is a huge unfolding tragedy. But it’s also an opportunity to learn lessons, and to rebuild very differently. Climate change no doubt played a role in the disaster, as warmer water generally feeds stronger storms. This season has seen a greater number of powerful, land-falling storms than the past few years combined. Four were Category 4 or 5, and three of them made landfall in the U.S.—a unique event in modern records. Puerto Rico is also vulnerable to rising seas: since 2010, average sea levels have increased at a rate of about 1 centimeter (0.4 inches) per year. And the process is accelerating, leading to erosion that’s devastating coastal communities. Even before the storms, Puerto Rico’s economy was in a tailspin. It depends largely on manufacturing and the service industry, notably tourism, but the prospects for both are dismal. The island’s population is shrinking as more and more people seek opportunities in the continental U.S.. Puerto Rico depends entirely on imported energy sources—including bunker oil for some of its electricity production, plus natural gas and coal. The Puerto Rico Electric Power Authority (PREPA) is a law unto itself, a monopoly that appears mismanaged (long close to bankruptcy), autocratic, and opaque. Over 80 percent of food is imported and the rate of car ownership is among the highest in the world (almost a car for each islander!). To top it off, Puerto Rico is also in the throes of a debt crisis. The Commonwealth owes more than $70 billion to creditors, with an additional $50 billion in pension obligations. On August 3 of the same year, Puerto Rico defaulted on a $58 million bond payment. The Commonwealth filed for bankruptcy in May of this year after failing to raise money in capital markets. A shrinking economy, a government unable to make debt payments, and a land vulnerable to rising seas and extreme weather: for those who are paying attention, this sounds like a premonition of global events in coming years. World debt levels have soared over the past decade as central banks have struggled to recover from the 2008 global financial crisis. Climate change is quickly moving from abstract scenarios to grim reality. World economic growth is slowing (economists obtusely call this “secular stagnation”), and is likely set to go into reverse as we hit the limits to growth that were first discussed almost a half-century ago. Could Puerto Rico’s present presage our own future? If so, then we should all care a great deal about how the United States responds to the crisis in Puerto Rico. This could be an opportunity to prepare for metaphoric (and occasionally real) storms bearing down on everyone. Invest in resilience. More shocks are on the way, so build redundancy in critical systems and promote pro-social behavior so that people’s first reflex is to share and to help one another. Promote local food. Taking advantage of the island’s climate, follow the Cuban model for incentivizing careers in farming and increase domestic food production using permaculture methods. Treat population decline as an opportunity. Lots of people will no doubt leave Puerto Rico as a result of the storm. This represents a cultural and human loss, but it also opens the way to making the size of the population of the island more congruent with its carrying capacity in terms of land area and natural resources. Rethink transportation. The island’s current highway-automobile dominance needs to give way to increased use of bicycles, and to the provision of streetcars and and light rail. An interim program of ride- and car-sharing could help with the transition. Repudiate debt. Use aid money to build a sharing economy, not to pay off creditors. Take a page from the European “degrowth” movement. An island currency and a Commonwealth bank could help stabilize the economy. Build a different energy system. Patching up the old PREPA electricity generating and distribution system would be a waste of money. That system is both corrupt and unsustainable. Instead, invest reconstruction funds in distributed local renewables and low-power infrastructure. These recommendations met with a polite response in 2013, but there was little subsequent evidence of a dramatic change of direction. That’s understandable: people tend to maintain their status quo as long as it’s viable. However, when people are in dire straits, they’re more likely to listen to unconventional advice. And when denial is no longer possible, they’re more likely to face reality. Obviously, the Puerto Rican people have immediate needs for food, water, fuel, and medical care. We mainland Americans should be doing all we can to make sure that help reaches those in the throes of crisis. But Puerto Ricans—all Americans, indeed all humans—should be thinking longer-term about what kind of society is sustainable and resilient in this time of increasing vulnerability to disasters of all kinds. SUBHEAD: It's vital for humans understand the story in which we play our small but significant part. 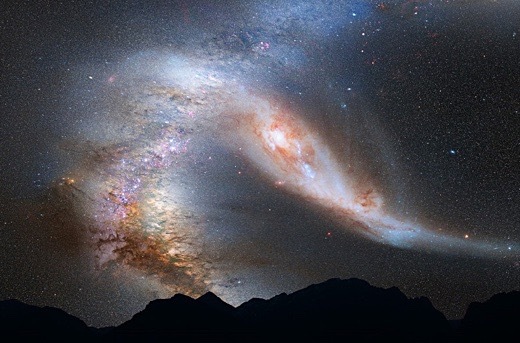 Image above: The Andromeda galaxy behind a silhouette of mountains. From original article. Back in the 1950s, sociologist C. Wright Mills wrote cogently about what he called “crackpot realism”—the use of rational, scientific, utilitarian means to pursue irrational, unscientific, or floridly delusional goals. It was a massive feature of American life in Mills’ time, and if anything, it’s become more common since then. Since it plays a central role in the corner of contemporary culture I want to discuss this week, I want to put a few moments into discussing where crackpot realism comes from, and how it wriggles its way into the apple barrel of modern life and rots the apples from skin to core. Let’s start with the concept of the division of labor. One of the great distinctions between a modern industrial society and other modes of human social organization is that in the former, very few activities are taken from beginning to end by the same person. A woman in a hunter-gatherer community, as she is getting ready for the autumn tuber-digging season, chooses a piece of wood, cuts it, shapes it into a digging stick, carefully hardens the business end in hot coals, and then puts it to work getting tubers out of the ground. Once she carries the tubers back to camp, what’s more, she’s far more likely than not to take part in cleaning them, roasting them, and sharing them out to the members of the band. A woman in a modern industrial society who wants to have potatoes for dinner, by contrast, may do no more of the total labor involved in that process than sticking a package in the microwave. Even if she has potatoes growing in a container garden out back, say, and serves up potatoes she grew, harvested, and cooked herself, odds are she didn’t make the gardening tools, the cookware, or the stove she uses. That’s division of labor: the social process by which most members of an industrial society specialize in one or another narrow economic niche, and use the money they earn from their work in that niche to buy the products of other economic niches. Let’s say it up front: there are huge advantages to the division of labor. It’s more efficient in almost every sense, whether you’re measuring efficiency in terms of output per person per hour, skill level per dollar invested in education, or what have you. What’s more, when it’s combined with a social structure that isn’t too rigidly deterministic, it’s at least possible for people to find their way to occupational specialties for which they’re actually suited, and in which they will be more productive than otherwise. Yet it bears recalling that every good thing has its downsides, especially when it’s pushed to extremes, and the division of labor is no exception. Crackpot realism is one of the downsides of the division of labor. It emerges reliably whenever two conditions are in effect. The first condition is that the task of choosing goals for an activity is assigned to one group of people and the task of finding means to achieve those goals is left to a different group of people. The second condition is that the first group needs to be enough higher in social status than the second group that members of the first group need pay no attention to the concerns of the second group. Consider, as an example, the plight of a team of engineers tasked with designing a flying car. People have been trying to do this for more than a century now, and the results are in: it’s a really dumb idea. It so happens that a great many of the engineering features that make a good car make a bad aircraft, and vice versa; for instance, an auto engine needs to be optimized for torque rather than speed, while an aircraft engine needs to be optimized for speed rather than torque. Thus every flying car ever built—and there have been plenty of them—performed just as poorly as a car as it did as a plane, and cost so much that for the same price you could buy a good car, a good airplane, and enough fuel to keep both of them running for a good long time. Still, if you’re an engineer and you’ve been hired by some clueless tech-industry godzillionaire who wants a flying car, you probably don’t have the option of telling your employer the truth about his pet project—that is, that no matter how much of his money he plows into the project, he’s going to get a clunker of a vehicle that won’t be any good at either of its two incompatible roles—because he’ll simply fire you and hire someone who will tell him what he wants to hear. Nor do you have the option of sitting him down and getting him to face what’s behind his own unexamined desires and expectations, so that he might notice that his fixation on having a flying car is an emotionally charged hangover from age eight, when he daydreamed about having one to help him cope with the miserable, bully-ridden public school system in which he was trapped for so many wretched years. So you devote your working hours to finding the most rational, scientific, and utilitarian means to accomplish a pointless, useless, and self-defeating end. That’s crackpot realism. You can make a great party game out of identifying crackpot realism—try it sometime—but I’ll leave that to my more enterprising readers. What I want to talk about right now is one of the most glaring examples of crackpot realism in contemporary industrial society. Yes, we’re going to talk about space travel again. No question, a fantastic amount of scientific, technological, and engineering brilliance went into the quest to insert a handful of human beings for a little while into the lethal environment of deep space and bring them back alive. Visit one of the handful of places on the planet where you can get a sense of the sheer scale of a Saturn V rocket, and the raw immensity of the effort that put a small number of human bootprints on the Moon is hard to miss. What’s much easier to miss is the whopping irrationality of the project itself. (I probably need to insert a parenthetical note here. Every time I blog about the space program, I can count on fielding at least one comment from some troll who insists that the Moon landings never happened. Outer space simply isn’t an environment where human beings can survive for long. It’s near-perfect vacuum at a temperature a few degrees above absolute zero; it’s full of hard radiation streaming out from the huge unshielded fusion reactor at the center of our solar system; it’s also got chunks of rock, lots of them, whizzing through it at better than rifle-bullet speeds; and the human body is the product of two billion years of evolutionary adaptation to environments that have the gravity, atmospheric pressure, temperature ranges, and other features that are found on the Earth’s surface and, as far as we know, nowhere else in the universe. A simple thought experiment will show how irrational the dream of human expansion into space really is. Consider the harshest natural environments on this planet—the stark summits of the Himalayas; the middle of the East Antarctic ice sheet in winter; the bleak Takla Makan desert of central Asia, the place caravans go to die; the bottom of the Marianas Trench, where the water pressure will reduce a human body to paste in seconds. Nowhere in the solar system, or on any of the exoplanets yet discovered by astronomers, is there a place that’s even as well suited to human life as the places I’ve just named. Logically speaking, before we try to settle the distant, airless, radiation-blasted deserts of Mars or the Moon, wouldn’t it make sense first to build cities on the Antarctic ice or in the lightless depths of the ocean? With one exception, in fact, every one of the arguments that has been trotted out to try to justify the settlement of Mars can be applied with even more force to the project of settling Antarctica. In both cases, you’ve got a great deal of empty real estate amply stocked with mineral wealth, right? Antarctica, though, has a much more comfortable climate than Mars, not to mention abundant supplies of water and a breathable atmosphere, both of which Mars lacks. Furthermore, it costs a lot less to get your colonists to Antarctica, they won’t face lethal irradiation on the way there, and there’s at least a chance that you can rescue them if things go very wrong. If in fact it made any kind of sense to settle Mars, the case for settling Antarctica would be far stronger. So where are the grand plans, lavishly funded by clueless tech-industry godzillionaires, to settle Antarctica? Their absence shows the one hard fact about settling outer space that next to nobody is willing to think about: it simply doesn’t make sense. The immense financial and emotional investments we’ve made in the notion of settling human beings on other planets or in outer space itself would be Exhibit A in a museum of crackpot realism. This is where the one exception I mentioned above comes in—the one argument for settling Mars that can’t also be made for settling Antarctica. This is the argument that a Martian colony is an insurance policy for our species. If something goes really wrong on Earth, the claim goes, and human beings die out here, having a settlement on Mars gives our species a shot at survival. Inevitably, given the present tenor of popular culture, you can expect to hear this sort of logic backed up by embarrassingly bad arguments. I’m thinking, for example, of a rant by science promoter Neil DeGrasse Tyson, who likes to insist that dinosaurs are extinct today because they didn’t have a space program. We’ll assume charitably that Tyson spent long nights stargazing in his teen years, and so tended to doze off during his high school biology classes; no doubt that’s why he missed three very obvious facts about dinosaurs. The first is that they were the dominant life forms on land for well over a hundred million years, which is a good bit longer than our species shows any likelihood of being able to hang on; the second is that the vast majority of dinosaur species went extinct for ordinary reasons—there were only a very modest number of dinosaur species around when the Chicxulub meteorite came screaming down out of space to end the Cretaceous Period; and the third is that dinosaurs aren’t extinct—we call them birds nowadays, and in terms of number of species, rates of speciation, and other standard measures of evolutionary vigor, they’re doing quite a bit better than mammals just now. Set aside the bad logic and the sloppy paleontology, though, and the argument just named casts a ruthlessly clear light on certain otherwise obscure factors in our contemporary mindset. The notion that space travel gets its value as a way to avoid human extinction goes back a long ways. I recall a book by Italian journalist Oriana Falacci, compiling her interviews with leading figures in the space program during its glory days; she titled it If The Sun Dies, after the passionate comment along these lines by one of her interviewees. Behind this, in turn, lies one of the profound and usually unmentioned fears that shapes the modern mind: the terror of deep time. There’s a profound irony in the fact that the geologists who first began to figure out the true age of the Earth lived in western Europe in the early nineteenth century, when most people believed that the world was only some six thousand years old. There have been plenty of cultures in recorded history that had a vision of time expansive enough to fit the facts of geological history, but the cultures of western Europe and its diaspora in the Americas and Australasia were not among them. Wedded to literalist interpretations of the Book of Genesis, and more broadly to a set of beliefs that assigned unique importance to human beings, the people who faced the first dim adumbrations of the vastness of Earth’s long history were utterly unprepared for the shock, and even less ready to have the first unnerving guesses that the Earth might be millions of years old replaced by increasingly precise measurements that gave its age in the billions of years, and that of the universe in the trillions. The brutal nature of the shock that resulted shouldn’t be underestimated. A society that had come to think of humanity as creation’s darlings, dwelling in a universe with a human timescale, found itself slammed facefirst into an unwanted encounter with the vast immensities of past and future time. That encounter had a great many awkward moments. The self-defeating fixation of evangelical Christians on young-Earth creationism can be seen in part as an attempt to back away from the unwelcome vista of deep time; so is the insistence, as common outside Christian churches as within them, that the world really will end sometime very soon and spare us the stress of having to deal with the immensity of the future. For that matter, I’m not sure how many of my readers know how stunningly unwelcome the concept of extinction was when it was first proposed: if the universe was created for the benefit of human beings, as a great many people seriously argued in those days, how could there have been so many thousands of species that lived and died long ages before the first human being walked the planet? Worse, the suspicion began to spread that the future waiting for humanity might not be an endless progression toward bigger and better things, as believers in progress insisted, or the end of the world followed by an eternity of bliss for the winning team, as believers in Christianity insisted, but extinction: the same fate as all those vanished species whose bones kept surfacing in geological deposits. It’s in the nineteenth century that the first stories of human extinction appear on the far end of late Romanticism, just as the same era saw the first tales that imagined the history of modern civilization ending in decline and fall. People read The Black Cloud and After London for the same rush of fascinated horror that they got from Frankenstein and Dracula, and with the same comfortable disbelief once the last page turned—but the same scientific advances that made the two latter books increasingly less believable made tales of humanity’s twilight increasingly more so. It became fashionable in many circles to dismiss such ideas as mere misanthropy, and that charge still gets flung at anyone who questions current notions of humanity’s supposed future in space. It’s a curious fact that I tend to field such comments from science fiction writers, more than from anyone else just now. A few years ago, when I sketched out a fictive history of the next ten billion years that included human extinction millions of years from now, SF writer David Brin took time out of his busy schedule to denounce it as “an infuriating paean to despair.” Last month’s post on the worlds that never were, similarly, fielded a spluttering denunciation by S.M. Stirling. It was mostly a forgettable rehash of the standard arguments for an interstellar future—arguments, by the way, that could be used equally well to justify continued faith in perpetual motion—but the point I want to raise here is that Stirling’s sole reaction to Aurora, Kim Stanley Robinson’s brilliant fictional critique of the interstellar-travel mythos, was to claim dismissively that Robinson must have suffered an attack of misanthropy. Some of my readers may remember Verruca Salt, the archetypal spoiled brat in Willy Wonka and the Chocolate Factory. When her father didn’t give her whatever she happened to want, her typical response was to shriek, “You don’t love me!” I think of that whenever somebody trots out the accusation of misanthropy in response to any realistic treatment of the limits that will shape the human future. It’s not misanthropy to point out that humanity isn’t going to outlast the sun or leap breezily from star to star; it’s simple realism, just as reminding someone that they will inevitably die is an expression not of hatred but of common sense. You, dear reader, will die someday. So will I, and so will every other human being. That fact doesn’t make our lives meaningless; quite the contrary, it’s when we come to grips with the fact of our own mortality that we have our best shot at achieving not only basic maturity, but that condition of reflective attention to meaning that goes by the name of wisdom. In exactly the same way, recognizing that humanity will not last forever—that the same Earth that existed and flourished long before our species came on the scene will exist and flourish long after our species is gone—might just provide enough of a boost of wisdom to help us back away from at least some of the more obviously pigheaded ways we’re damaging the biosphere of the only planet on which we can actually live. There’s something else to be found in the acceptance of our collective mortality, though, and I’m considering exploring it in detail over the months ahead. Grasp the fact that our species is a temporary yet integral part of the whole system we call the biosphere of the Earth, and it becomes a good deal easier to see that we are part of a story that didn’t begin with us, won’t end with us, and doesn’t happen to assign us an overwhelmingly important role. Traumatic though this may be for the Verruca Saltish end of humanity, with its distinctly overinflated sense of importance, there’s much to be gained by ditching the tantrums, coming to terms with our decidedly modest place in the cosmos, and coming to understand the story in which we play our small but significant part. SUBHEAD: Puerto Rico is back in the 18th Century, minus the practical skills for living that way of life. 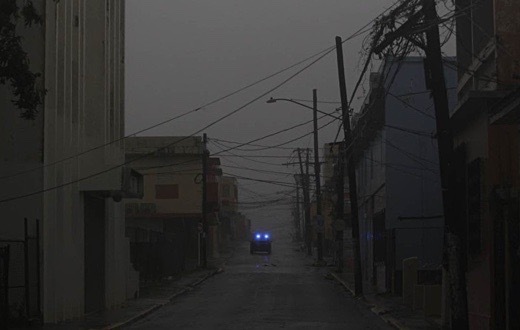 Image above: Before dawn a police car patrols as the hurricane hits in Fajardo, in northeast Puerto Rico. From (https://www.nbcnews.com/slideshow/hurricane-maria-lashes-storm-battered-caribbean-n802936). Meaning, I guess, no more playing Resident Evil 7: Biohazard on-screen because you’ll be living it — though one wonders where will the money come from to buy the ball and glove? Few Puerto Ricans will be going to work with the power off. And the island’s public finances were in disarray sufficient to drive it into federal court last May to set in motion a legal receivership that amounted to bankruptcy in all but name. The commonwealth, a US territory, was in default for $74 billion in bonded debt, plus another $49 billion in unfunded pension obligations. So, Puerto Rico already faced a crisis pre-Hurricane Maria, with its dodgy electric grid and crumbling infrastructure: roads, bridges, water and sewage systems. Bankruptcy put it in a poor position to issue new bonds for public works which are generally paid for with public borrowing. Who, exactly, would buy the new bonds? I hear readers whispering, “the Federal Reserve.” Which is a pretty good clue to understanding the circle-jerk that American finance has become. Some sort of bailout is unavoidable, though President Trump tweeted “No Bailout for Puerto Rico” after the May bankruptcy proceeding. Things have changed and the shelf-life of Trumpian tweets is famously brief. But the crisis may actually strain the ability of the federal government to pretend it can cover the cost of every calamity that strikes the nation — at least not without casting doubt on the soundness of the dollar. And not a few bonafide states are also whirling around the bankruptcy drain: Illinois, Connecticut, New Jersey, Kentucky. 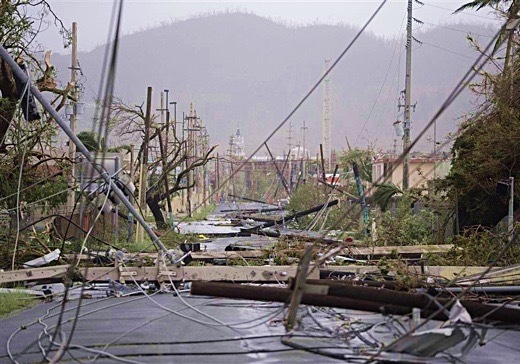 Image above: In daylight electricity poles and lines lay toppled on the road in Humacao in southeast Puerto Rica. From (https://www.nbcnews.com/slideshow/hurricane-maria-lashes-storm-battered-caribbean-n802936). Constitutionally states are not permitted to declare bankruptcy, though counties and municipalities can. Congress would have to change the law to allow it. But states can default on their bonds and other obligations. Surely there would be some kind of fiscal and political hell to pay if they go that route. Nobody really knows what might happen in a state as big and complex as Illinois, which has been paying its way for decades by borrowing from the future. Suddenly, the future is here and nobody has a plan for it. The case for the federal government is not so different. It, too, only manages to pay its bondholders via bookkeeping hocuspocus, and its colossal unfunded obligations for social security and Medicare make Illinois’ predicament look like a skipped car payment. In the meantime — and it looks like it’s going to be a long meantime — Puerto Rico is back in the 18th Century, minus the practical skills and simpler furnishings for living that way of life, and with a population many times beyond the carrying capacity of the island in that era. I’ve been there and much of the island is as suburbanized as New Jersey — thanks to the desire to be up-to-date with the mainland, and the willingness of officials to make it look like that. We’re only two days past the Hurricane Maria’s direct hit on Puerto Rico and there is no phone communication across the island, so we barely know what has happened. We’re weeks past Hurricanes Irma and Harvey, and news of the consequences from those two events has strangely fallen out of the news media. Where have the people gone who lost everything? The news blackout is as complete and strange as the darkness that has descended on Puerto Rico. SUBHEAD: Neofeudalism is not a re-run of feudalism. It's a "new and improved", state-corporate version of indentured servitude. Image above: Detail of a tapestry depicting feudal era agricultural work in "The Twelve Months of the Year" by Master of the Geneva Boccacci circa 1470AD. . From (https://commons.wikimedia.org/wiki/File:Crescenzi_calendar.jpg). "Democracy" (i.e. political influence) and ownership of productive assets are the exclusive domains of the New Aristocracy. Neoliberal: the commoditization / financialization of every asset, input (such as labor) and output of the economy; the privatization of the public commons, and the maximizing of private profits while costs and losses are socialized, i.e. transferred to the taxpayers. Neocolonial: the exploitation of the domestic populace using the same debt-servitude model used to subjugate, control and extract profits from overseas populations. Neofeudal: the indenturing of the workforce via debt and financial repression to a new Aristocracy; the disempowerment of the workforce into powerless debt-serfs. The book The Inheritance of Rome: Illuminating the Dark Ages 400-1000 shed some light on the transition to a feudal society and economy. While the author is a fine writer, the subject matter doesn't lend itself to light reading. The transition from the Roman legacy of centralized governance (empire, monarchy, theocracy, etc.) to feudalism (governance by local lords / aristocracy) was complex and uneven, and the author takes pains to describe the process and many variations that arose in a highly fragmented post-Roman Europe. The other key dynamic of feudalism was the removal of the peasantry from the public sphere. In the pre-feudal era (for example, the reign of Charlemagne), peasants could still attend public councils and make their voices heard, and there was a rough system of justice in which peasants could petition authorities for redress. From the capitalist perspective, feudalism restricted serfs' access to cash markets where they could sell their labor or harvests. The key feature of capitalism isn't just markets-- it's unrestricted ownership of productive assets--land, tools, workshops, and the social capital of skills, networks, trading associations, guilds, etc. Our system is Neofeudal because the non-elites have no real voice in the public sphere, and ownership of productive capital is indirectly suppressed by the state-corporate duopoly. The so-called middle class owns little to no productive capital; what it "owns" is a house, which is ultimately a form of consumption. I say "owns" for two reasons: one, most households have a mortgage, so their ownership is still contingent on making monthly payments to a lender, and two, the government collects property taxes on the home regardless of the owner's income or ability to pay. SUBHEAD: Grid Beam is a kind of LEGO, or Erector Set, for grownups who want to build real things. 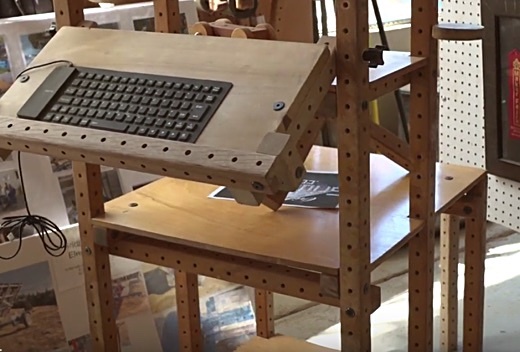 Image above: A computer workstation built by the Jergensons using the wooden Grid Beam system. Still frame from video below. Grid Beam is a kind of LEGO, or Erector Set, for grownups who want to build real things. Its creators, brothers Phil and Richard Jergenson, have used it to create tiny houses, furniture, electric vehicles, bicycles and even a solar train car that made a 44-mile run on working rail. The Jergensons grew up playing with modular toys- LEGOs, Meccano, Erector Sets, Lincoln Logs- and wanted to apply this technology to help people construct their own environments, whether car, bike or bed. Phil’s daughter, Rona, grew up with a set of Grid Beam (then called Box Beam) and constantly re-modeled her room. The Grid Beam brothers operate an off-grid, solar-powered shop in Willits, CA (Mendocino County) where they manufacture and sell the hardware: 2x2 wood (or aluminium) beams with holes drilled through every 1 ½ inches, as well as, standard furniture bolts and accessories like wheels, bicycle pedals or feet for tiny houses. Video above: A 28 minute video explaining Grid Beam system and examples of things the Jergenson brothers have constructed with it. From (https://youtu.be/PIMESt9iLYg). And given the consistent pattern of the Grid Beams, designs are easily replicated. “If you just count the holes you can duplicate these frames just by looking at a couple of photos,” explains Phil. “You can do anything for a fraction of the price. I see people being able to build their own tiny house and tiny electric car for easily 2 or 3 thousand dollars because that’s the cost of the components,” argues Phil. SUBHEAD: How will we be able to rely on renewable solar and wind power to run our society. Image above: Windmill in Moulbaix, Belgium, 17th/18th century. Photo by Jean-Pol GrandMont. From original article. While the potential of wind and solar energy is more than sufficient to supply the electricity demand of industrial societies, these resources are only available intermittently. To ensure that supply always meets demand, a renewable power grid needs an oversized power generation and transmission capacity of up to ten times the peak demand. It also requires a balancing capacity of fossil fuel power plants, or its equivalent in energy storage. Consequently, matching supply to demand at all times makes renewable power production a complex, slow, expensive and unsustainable undertaking. Yet, if we would adjust energy demand to the variable supply of solar and wind energy, a renewable power grid could be much more advantageous. Using wind and solar energy only when they're available is a traditional concept that modern technology can improve upon significantly. It is widely believed that in the future, renewable energy production will allow modern societies to become independent from fossil fuels, with wind and solar energy having the largest potential. An oft-stated fact is that there's enough wind and solar power available to meet the energy needs of modern civilisation many times over. Due to a lack of thermal or mechanical inertia in solar photovoltaic (PV) systems, the changes due to clouds can be dramatic. The combination of these predictable and unpredictable variations in solar power makes it clear that the output of a solar power plant can vary enormously throughout time. Compared to solar energy, the variability of the wind is even more volatile. On the one hand, wind energy can be harvested both day and night, while on the other hand, it's less predictable and less reliable than solar energy. During daylight hours, there's always a minimum amount of solar power available, but this is not the case for wind, which can be absent or too weak for days or even weeks at a time. There can also be too much wind, and wind turbines then have to be shut down in order to avoid damage. For many locations, only average wind speed data is available. However, the chart above shows the daily and hourly wind power output on 29 different days at a wind farm in California. To some extent, wind and solar energy can compensate for each other. For example, wind is usually twice as strong during the winter months, when there is less sun. However, this concerns average values again. First, we could count on a backup infrastructure of dispatchable fossil fuel power plants to supply electricity when there's not enough renewable energy available. Second, we could oversize the renewable generation capacity, adjusting it to the worst case scenario. Third, we could connect geographically dispersed renewable energy sources to smooth out variations in power production. Fourth, we could store surplus electricity for use in times when solar and/or wind resources are low or absent. Up to now, the relatively small share of renewable power sources added to the grid has been balanced by dispatchable forms of electricity, mainly rapidly deployable gas power plants. Most scientific research focuses on Europe, which has the most ambitious plans for renewable power. For a power grid based on 100% solar and wind power, with no energy storage and assuming interconnection at the national European level only, the balancing capacity of fossil fuel power plants needs to be just as large as peak electricity demand. In other words, there would be just as many non-renewable power plants as there are today. Such a hybrid infrastructure would lower the use of carbon fuels for the generation of electricity, because renewable energy can replace them if there is sufficient sun or wind available. However, lots of energy and materials need to be invested into what is essentially a double infrastructure. The energy that's saved on fuel is spent on the manufacturing, installation and interconnection of millions of solar panels and wind turbines. Strategy 2: Oversizing Renewable Power ProductionAnother way to avoid energy shortages is to install more solar panels and wind turbines. If solar power capacity is tailored to match demand during even the shortest and darkest winter days, and wind power capacity is matched to the lowest wind speeds, the risk of electricity shortages could be reduced significantly. However, the obvious disadvantage of this approach is an oversupply of renewable energy for most of the year. During periods of oversupply, the energy produced by solar panels and wind turbines is curtailed in order to avoid grid overloading. Problematically, curtailment has a detrimental effect on the sustainability of a renewable power grid. It reduces the electricity that a solar panel or wind turbine produces over its lifetime, while the energy required to manufacture, install, connect and maintain it remains the same. Curtailment rates increase spectacularly as wind and solar comprise a larger fraction of the generation mix, because the overproduction's dependence on the share of renewables is exponential. Scientists calculated that a European grid comprised of 60% solar and wind power would require a generation capacity that's double the peak load, resulting in 300 TWh of excess electricity every year (roughly 10% of the current annual electricity consumption in Europe). For solar panels, the energy payback would only occur in 12-24 years in a power grid with 80% renewables, and in 20-40 years in a power grid with 100% renewables. Although today's power systems in Europe and the USA stretch out over a large enough area, these grids are currently not strong enough to allow interconnection of renewable energy sources. For a European grid with a share of 60% renewable power (an optimal mix of wind and solar), grid capacity would need to be increased at least sevenfold. If individual European countries would disregard national concerns about security of supply, and backup balancing capacity would be optimally distributed throughout the continent, the necessary grid capacity extensions can be limited to about triple the existing European high-voltage grid. The problems with such grid extensions are threefold. Firstly, building infrastructure such as transmission towers and their foundations, power lines, substations, and so on, requires a significant amount of energy and other resources. This will need to be taken into account when making a life cycle analysis of a renewable power grid. As with oversizing renewable power generation, most of the oversized transmission infrastructure will not be used for most of the time, driving down the transmission capacity factor substantially. Secondly, a supergrid involves transmission losses, which means that more wind turbines and solar panels will need to be installed to compensate for this loss. This is not just bureaucratic hassle: transmission lines have a high impact on the land and often face local opposition, which makes them one of the main obstacles for the growth of renewable power production. 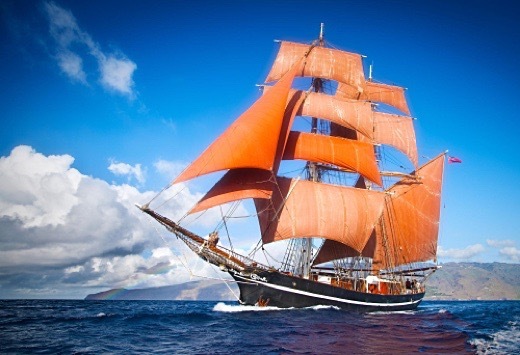 Image above: One hundred year old brig "Eye of the Wind" is still sailing commercially. From original article. First of all, while there's no need to build and maintain a backup infrastructure of fossil fuel power plants, this advantage is negated by the need to build and maintain an energy storage infrastructure. Second, all storage technologies have charging and discharging losses, which results in the need for extra solar panels and wind turbines to compensate for this loss. The energy required to build and maintain the storage infrastructure and the extra renewable power plants need to be taken into account when conducting a life cycle analysis of a renewable power grid. To give an idea of what this means: the most optimistic estimation of Europe's total potential for pumped hydro-power energy storage is 80 TWh , while converting all 250 million passenger cars in Europe to electric drives with a 30 kWh battery would result in a total energy storage of 7.5 TWh. In other words, if we count on electric cars to store the surplus of renewable electricity, their batteries would need to be 60 times larger than they are today (and that's without allowing for the fact that electric cars will substantially increase power consumption). In conclusion, calculating only the energy payback times of individual solar panels or wind turbines greatly overestimates the sustainability of a renewable power grid. If we want to match supply to demand at all times, we also need to factor in the energy use for overbuilding the power generation and transmission capacity, and the energy use for building the backup generation capacity and/or the energy storage. The need to overbuild the system also increases the costs and the time required to switch to renewable energy. If we could manage to adjust all energy demand to variable solar and wind resources, there would be no need for grid extensions, balancing capacity or overbuilding renewable power plants. Likewise, all the energy produced by solar panels and wind turbines would be utilised, with no transmission losses and no need for curtailment or energy storage. Of course, adjusting energy demand to energy supply at all times is impossible, because not all energy using activities can be postponed. However, the adjustment of energy demand to supply should take priority, while the other strategies should play a supportive role. If we let go of the need to match energy demand for 24 hours a day and 365 days a year, a renewable power grid could be built much faster and at a lower cost, making it more sustainable overall. Before the Industrial Revolution, both industry and transportation were largely dependent on intermittent renewable energy sources. The variability in the supply was almost entirely solved by adjusting energy demand. For example, windmills and sailing boats only operated when the wind was blowing. In the next article, I will explain how this historical approach could be successfully applied to modern industry and cargo transportation.